NOTE: Different countries have different restrictions on what can be packed in a shoebox due to customs...be sure to check the guidelines from your national organization before packing! He tucked the plain paper and envelope in the front of the composition book. Which he then put in the bottom of the box-tucking the comb in the corner space. Then came the tote bag & toothbrush. Then came the pencil kit with school & art supplies and some of the toys and games. Then the candy on one side and soap on the other with more toys and stuffed animal added. 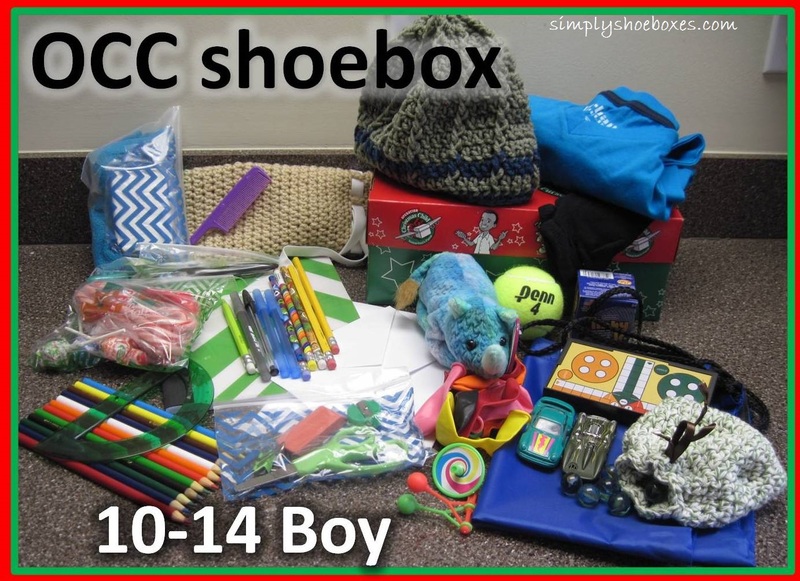 You can see another of his boxes here: Operation Christmas Child Shoebox for a 10 to 14 Year Old Boy. Great post!! It is so nice to see how you pack an actual box!! great box! i packed 10 boxes this year, 2 10-14 girls, 1 10-14 boy, 2 2-4 boys, 2 2-4 girl, 1 5-9 boy, 2 5-9 girls. and all the boxes only cost me 20.00! yah! i also sent fillers and even saw that my fillers were able to fill another 10 boxes! God is an awesome God! i hope they enjoy their Christmas gifts, and learn of the amazing love of our Lord! did i tell you i am only 11 years old! That's great Marcy! Thanks for sharing! thank you for all the great ideas and deals! without this site i wouldent know about occ! you inspire me to: work hard for occ. shop hard. pray hard. i love packing shoe boxes and could not imagine life without occ. i am one of those kind of people who need a project a goal and a pourpose. i use to be rude and unkind and quite sassy just trying to find some thing out of nothing. then i heard about occ and everything changed! thank you Sarah for you kind words of wisdom! YOU ARE TRULY BLESSING MANY CHILDREN! Thank you so much for your kind words! I'm glad to have been able to help you...and the children!